1. In a medium bowl, add lemon juice, diced apples and peaches. Gently toss. 2. 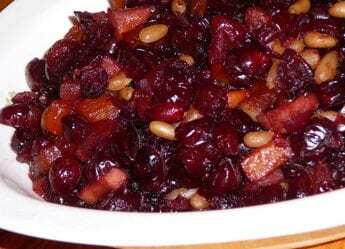 In a medium saucepan combine cranberries, lemon-coated apples and peaches, water and 3 oz. of vino cotto. 3. Cover the saucepan. On low heat slowly simmer for 10 minutes then remove the cover and stir. 4. Continue cooking uncovered on low heat until the fruit becomes tender, but not overcooked. Stir frequently so the fruit cooks evenly. 5. When done remove from the heat and allow to cool. 6. Add nuts and mix together. 7. Plate into a serving bowl and drizzle the remaining ½ oz. of vino cotto over the fruit conserve. 8. Serve cold as a condiment beside turkey, chicken, pork or lamb.